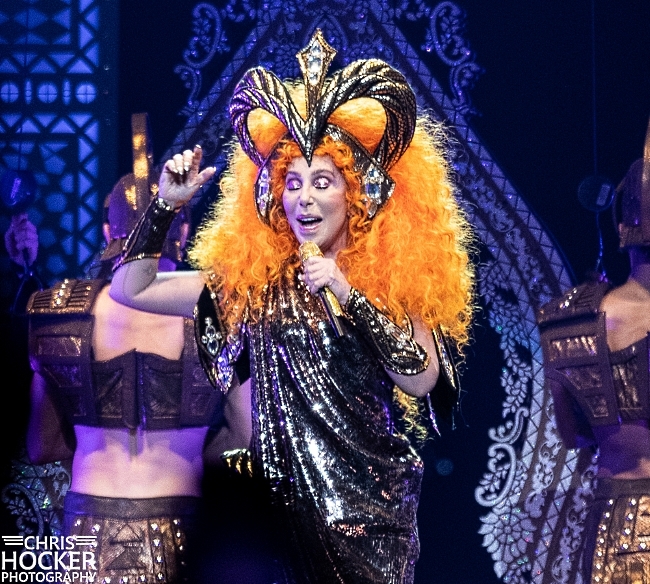 Cher brought her Here We Go Again tour to Charlotte's Spectrum Center on Tuesday night. 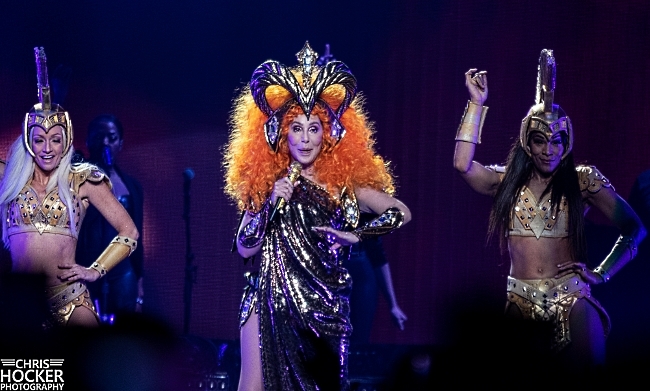 It was splashy, iconic, and fun -- in short, everything you'd expect from a Cher show. The concert was a mix of her solo work, cover songs, a few from the Sonny & Cher days, and of course tons of costume changes. Seven, actually. 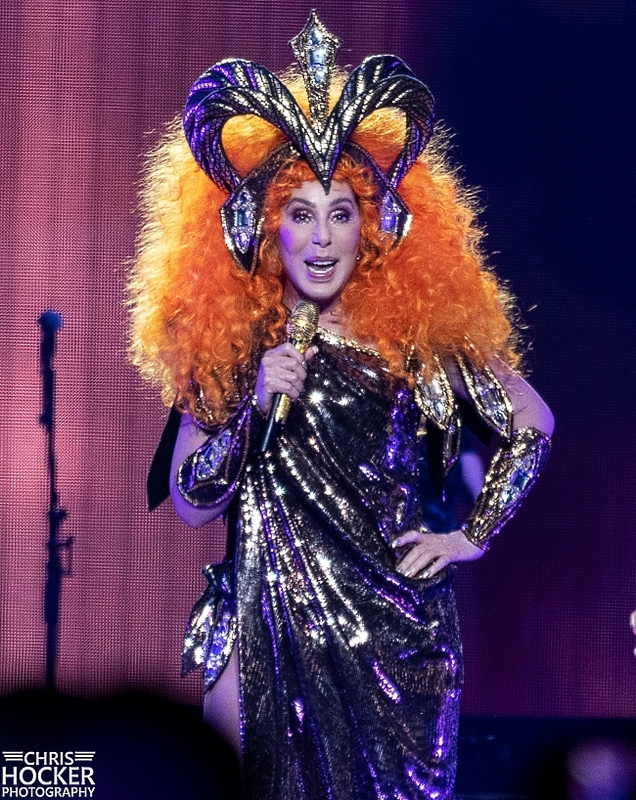 Cher would come out, perform a few songs, and then go backstage to change into an outfit and don a new wig while classic videotape/songs were shown or the backup dancers performed acrobatics. This annoyed some folks who complained they wanted more music and less pageantry. Apparently, they had never heard of Cher before. You should embrace the music and the pageantry. 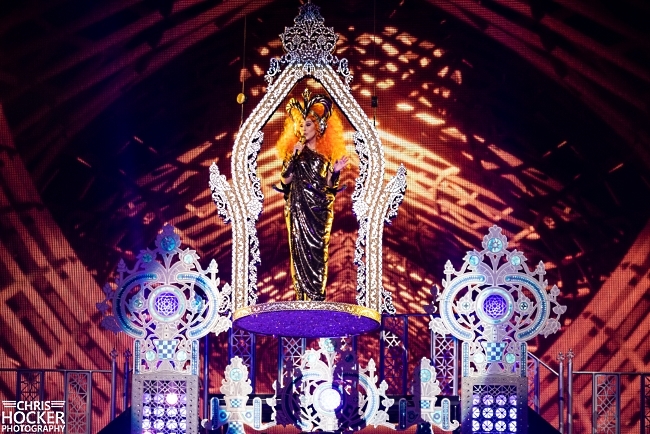 Amid the dancing and costume changes, Cher performed some of her biggest solo hits ("I Found Someone," "If I Could Turn Back Time," "Believe"); three ABBA songs ("Waterloo," "SOS," "Fernando") from Dancing Queen, her recent ABBA cover album; and two Sonny & Cher songs, one of which was the highlight of the show. Prior to performing "I Got You Babe," Cher talked about how she thought long and hard about performing this song live and that she always wanted to save it for her farewell tour. She then told everyone she's 500 years old, so this probably is her farewell tour. She then launched into "I Got You Babe" with Sonny singing his part from the huge screen. Cher is still Cher. Full of sass, a great performer, and ready to mesmerize you with her voice and her outfits. Point blank: if you have a chance to go see Cher, you must take it! Remember, she is 500 years old.